Although it doesn’t feel much like Fall around here, we’re still gearing up for all the beauty and coziness the season will bring. If you’re coming from North Country Nest, then welcome. 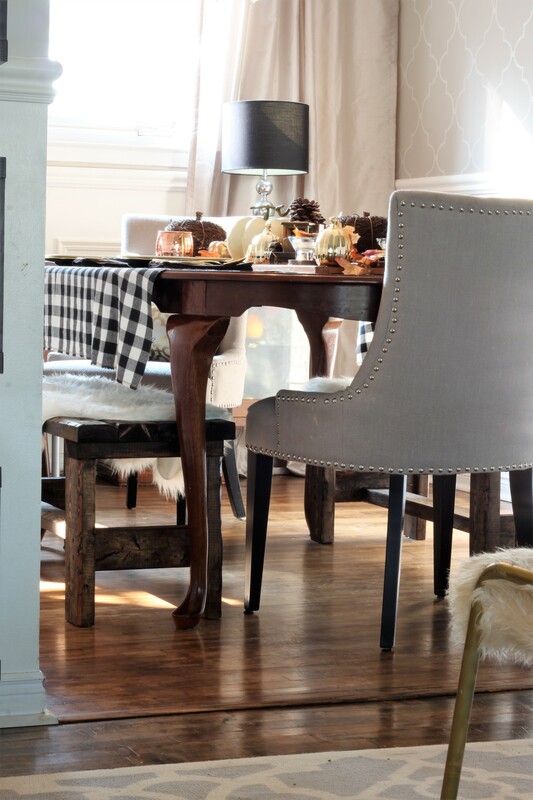 Don’t you just love how Brett and Kelly have made their home so warm and comfy for the Fall? 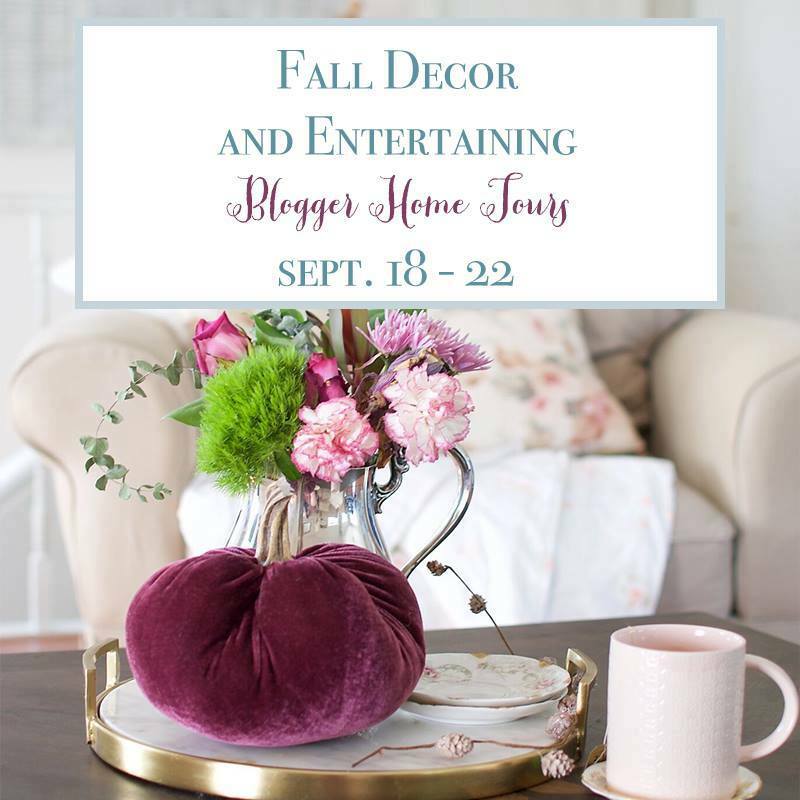 I’m so happy to be teaming up with some truly talented ladies to bring you this Fall Blog Hop and a huge thank you to Angelina from Peonies and Orange Blossoms for hosting. 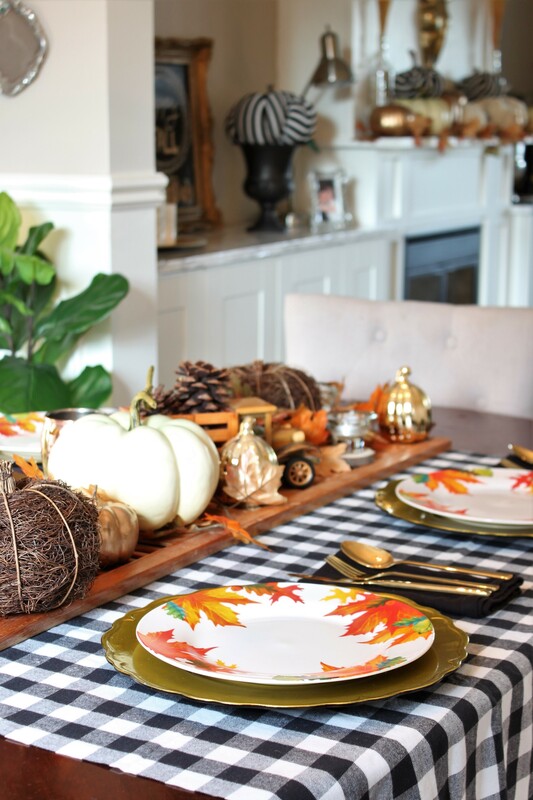 Be sure to check out how my blogging friends have decked out their homes for Fall at the end of this post. We’re going to start our tour in the formal living room, where I went with a neutral palette. 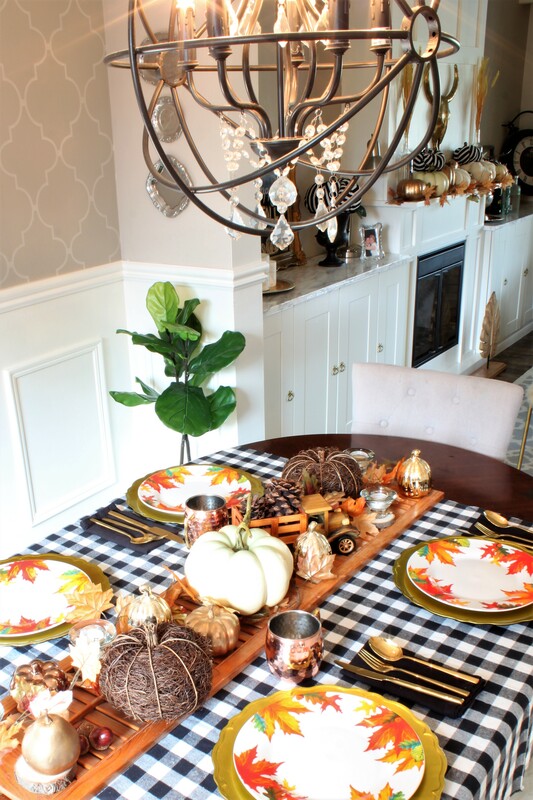 I added more Fall touches with antlers and pinecones along with some faux leaves from the dollar store. 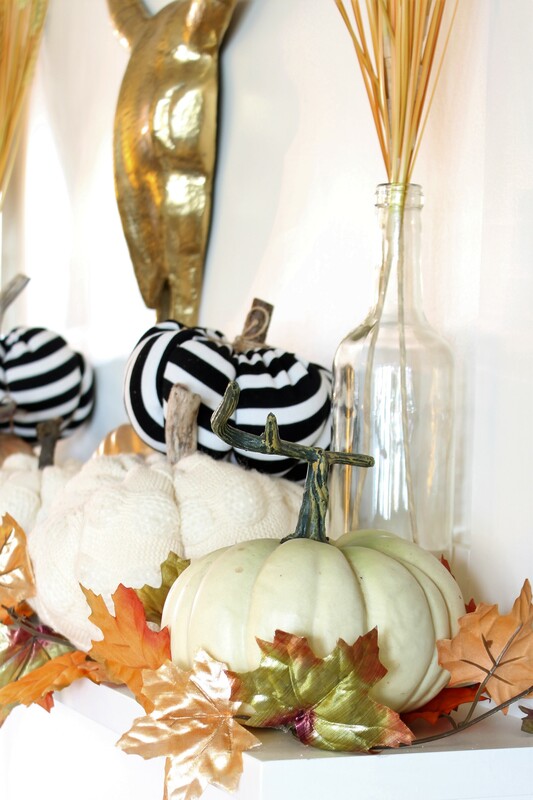 I made these striped black and white pumpkins last year and they still work with the neutral scheme and also work with my Halloween decor too. Bonus!!! 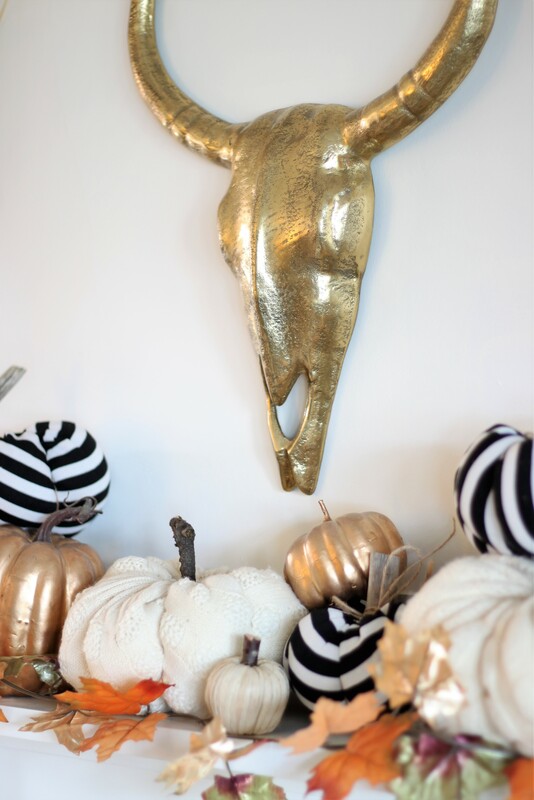 This gold bull head was a score from Walmart and I took cues from that when I decided to use metallic accents. 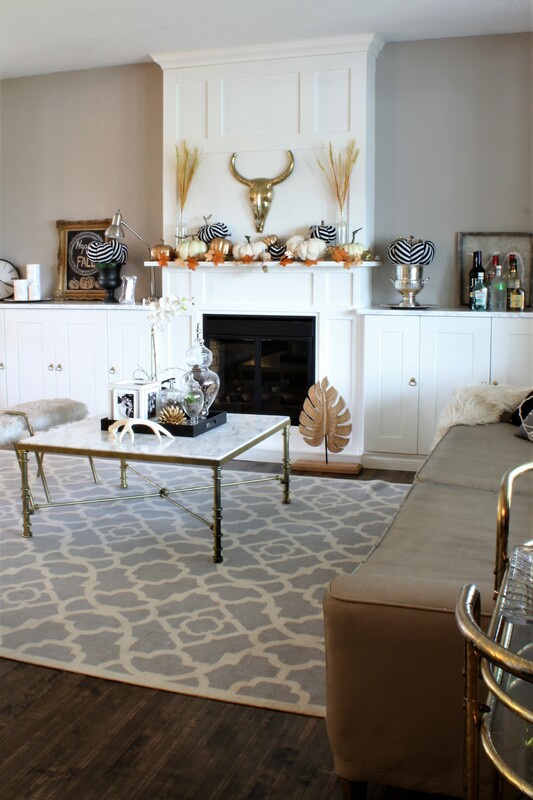 These faux leaves brought just the right amount of orange to the white mantel and fit in well with the shiny metallic tones. I also have my seasonal chalkboard all ready to go for Fall. More metallic blended with Spanish moss and pinecones make for a unique tabletop display. Right off the formal living room is the dining room, where the neutral colours are carried through. I recently ditched my tired old pleather parsons chairs for these fun custom benches. 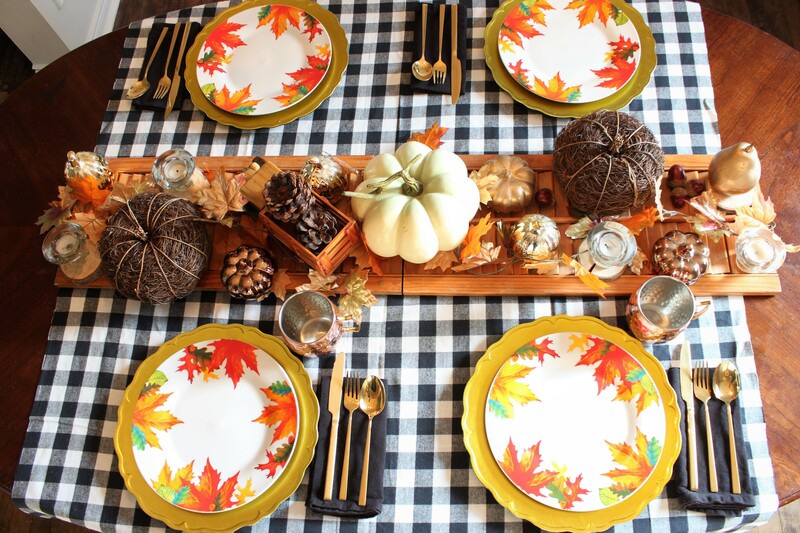 I used some old wood shutters as a table runner and piled some Fall decor on top. 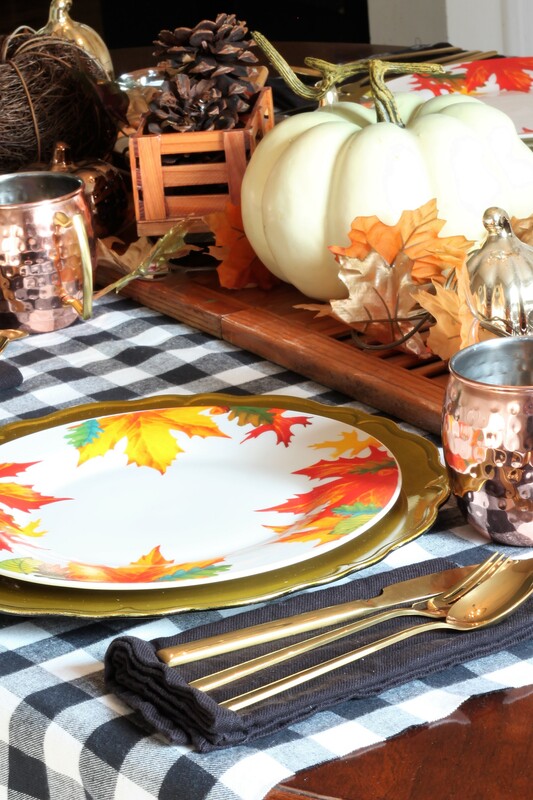 These fun Fall plates were scooped up from the Dollar Tree for $1.25 each. 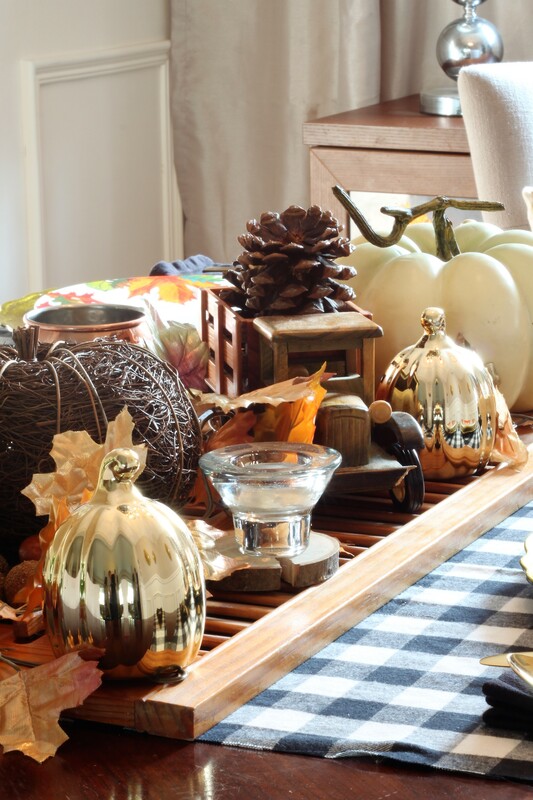 I think my favourite part of the table is the little wooden truck I thrifted years ago, complete with pinecones in the truck bed. 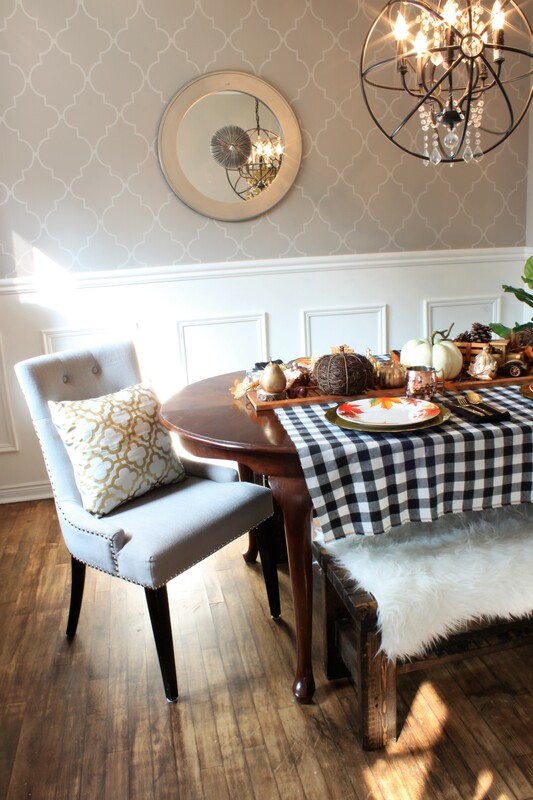 I used more black and white in the dining room, but instead of stripes, I went with a buffalo check. My dining room is pretty neutral, so dressing up the table in a fun and quirky way is always a blast. Heading through the kitchen is our den, which has pretty much been taken over by our new puppy. 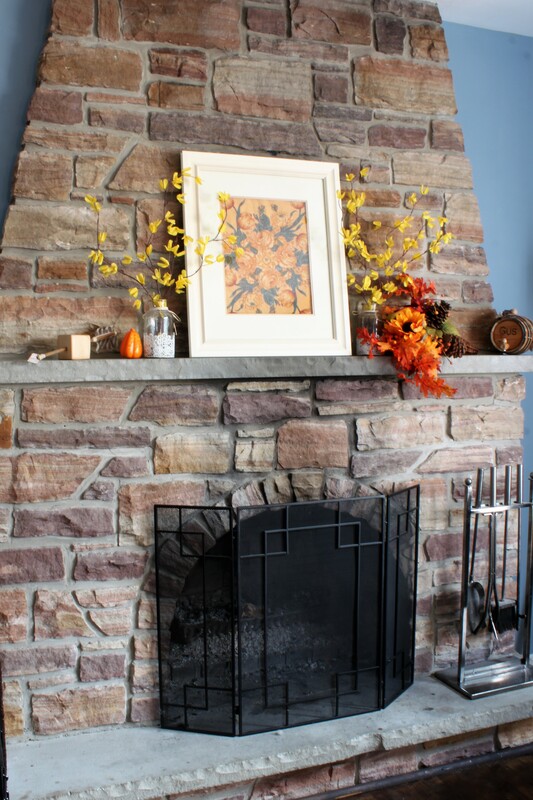 I did manage to do a little Fall decorating though on the mantel including adding a placement as artwork in Fall colours. Thank you so much for joining me on this little house tour. Be sure to head on over to Hood Creek Log Cabin for the next stop on our Fall Home Tour Series. Your home is lovely. I like everyone else am crazy about your black & white pumpkins. I’ll have to snoop through your blog to see if you posted anything about how you made them. Happy Fall! ? 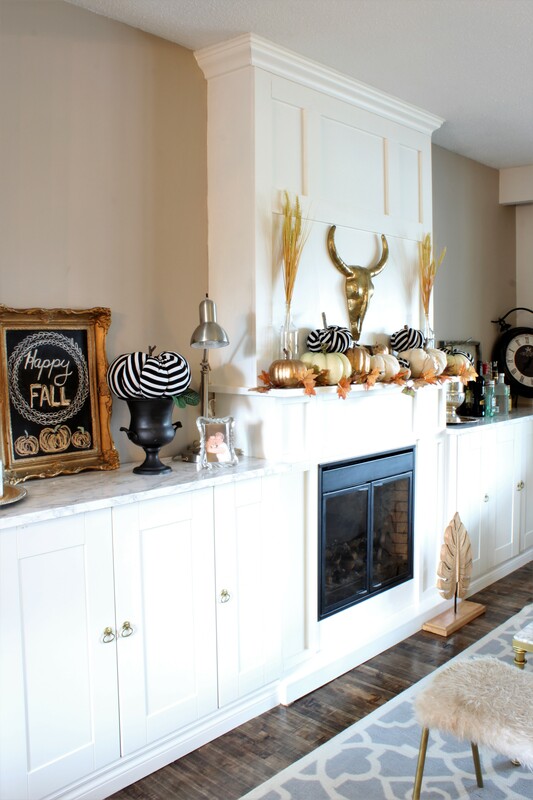 Sue, your fireplace is fabulous and your black and white pumpkins are so chic! 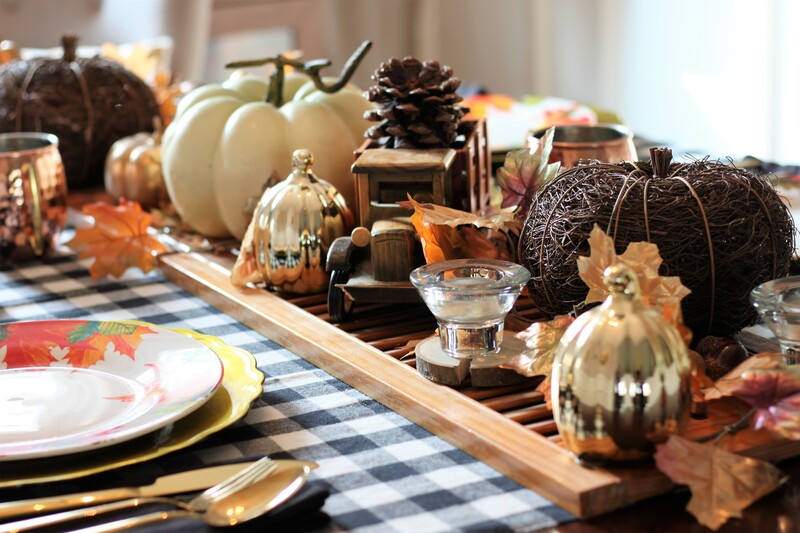 I love the tablescape! Sue, as always, I leave here so inspired!! You have such a fun, unique home and I love the beautiful golds and coppers mixed in. The black & white pumpkins are so cool!! Very warm and inviting space!! Hi Sue…I love your black and white pumpkins! Anything that can transition from fall to Halloween is always a bonus in my books, too! And the black and white buffalo check tablecloth looks awesome, too! 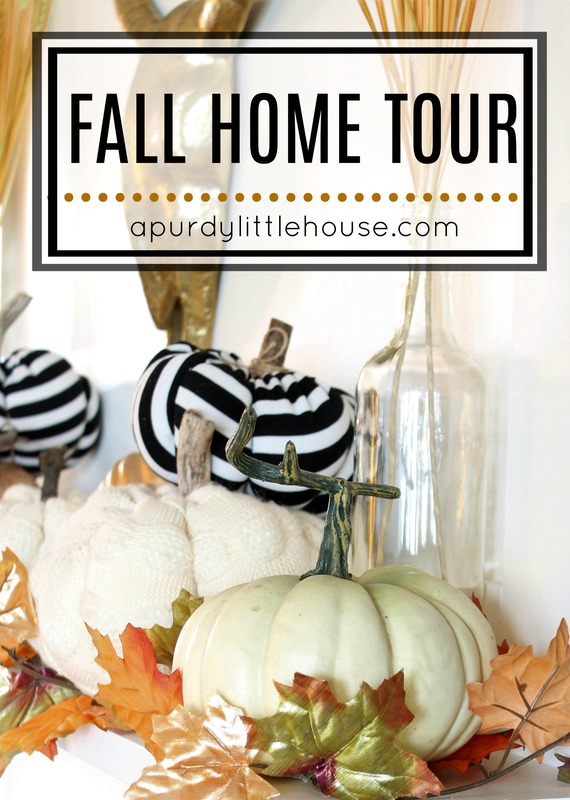 This fall home tour is amazing. All pictures are gorgeous. I love those striped pumpkins! Such a great idea! Your home is lovely! 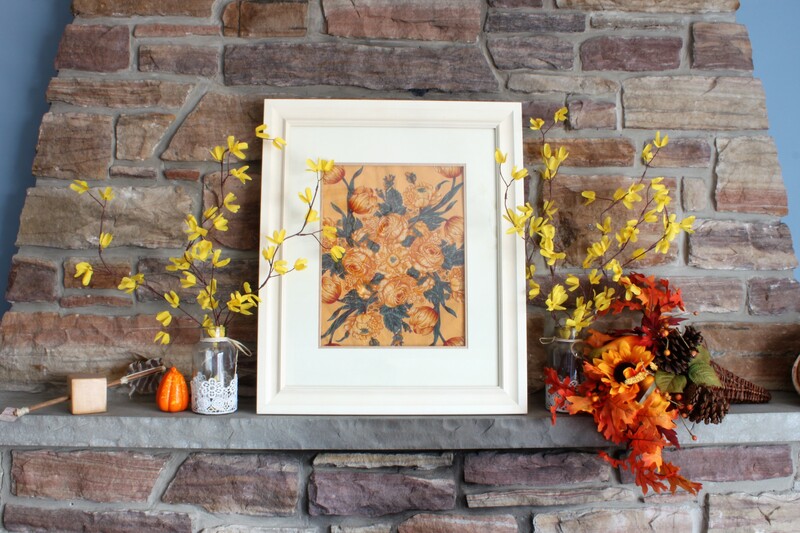 Your home is beautiful so cozy for fall with two fireplaces. The mantel is beautiful but my favorite part is your table. The large centerpiece resting on the shutter is stunning, I absolutely love it. Beautiful home! I love all the black and white mixed in! Such a fun addition! Happy to be on this tour with you! Happy fall!! Your home is beautiful! I am really digging the vibes from your mantle. Thank you for joining the blog tour!! Your home look so amazingly warm and welcoming. Thank you for sharing your beautiful taste. You have such a charming home. I love your style. Chic farmhouse!! I love those adorable striped pumpkins you made. – the black and white make everything stand out.. It was nice to join you on this fun Fall Home Tour. Hi Sue! Your home is lovely! 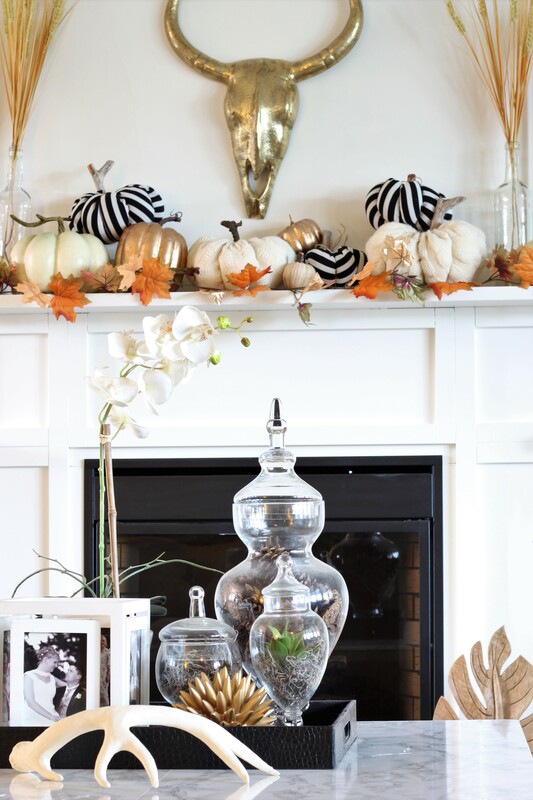 I absolutely adore those black and white pumpkins!!!! 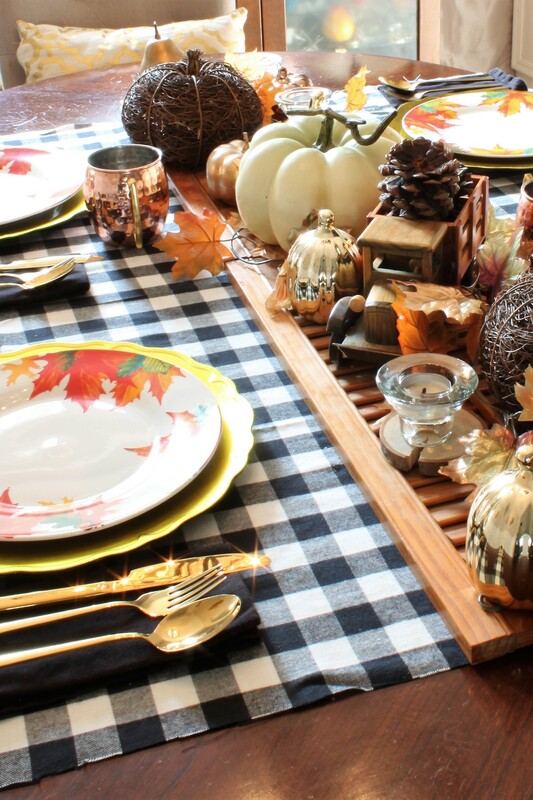 Your Fall table looks amazing with the black and white buffalo check!! Love it!! Sue…you had me at those graphic pumpkins and the buffalo check…and that amazing chalkboard 🙂 Beautiful rustic decor, I love it all!! Your home is beautiful! 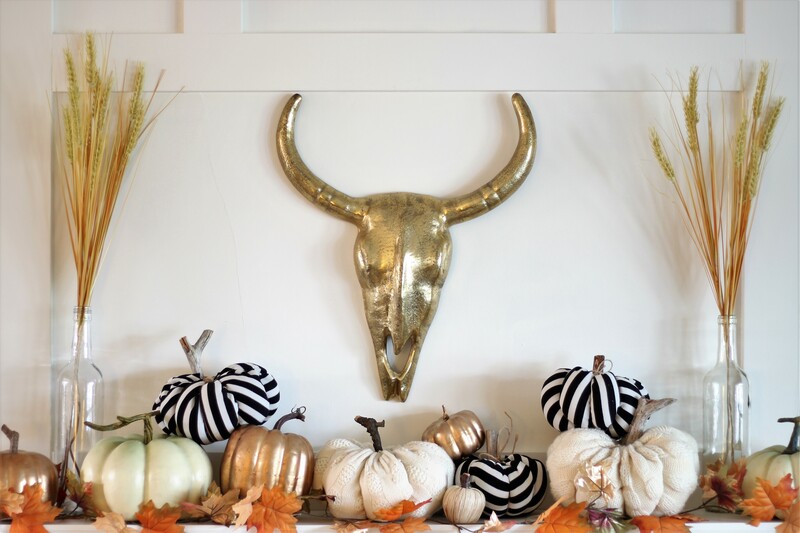 I love the bull head that you used over your fireplace. 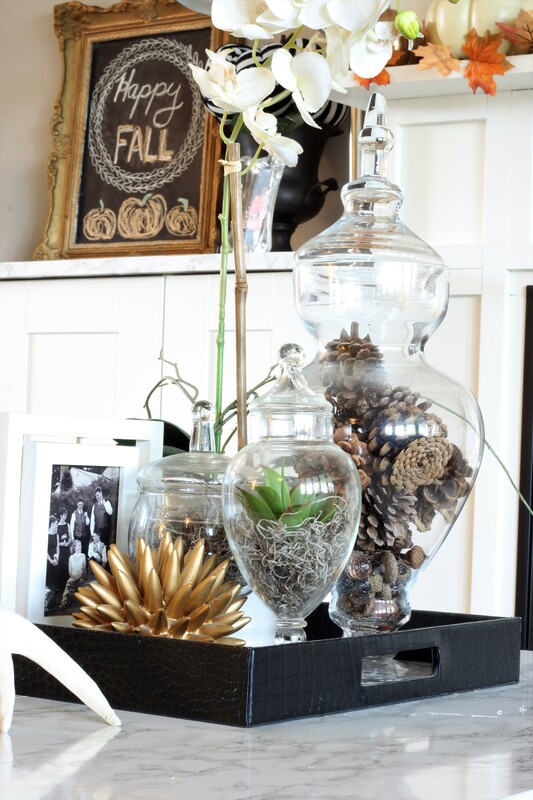 It is unique and looks great with your fall pumpkin display. 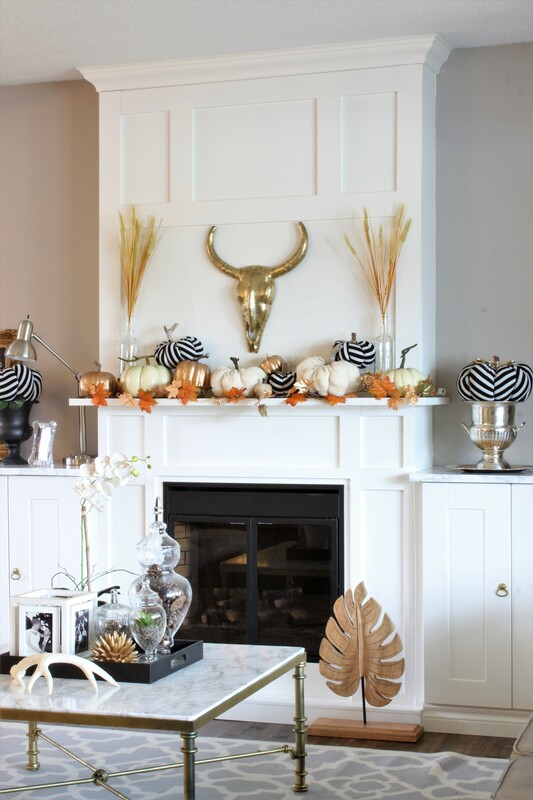 The black and white pumpkins contrast so nicely with the others in neutral colors. 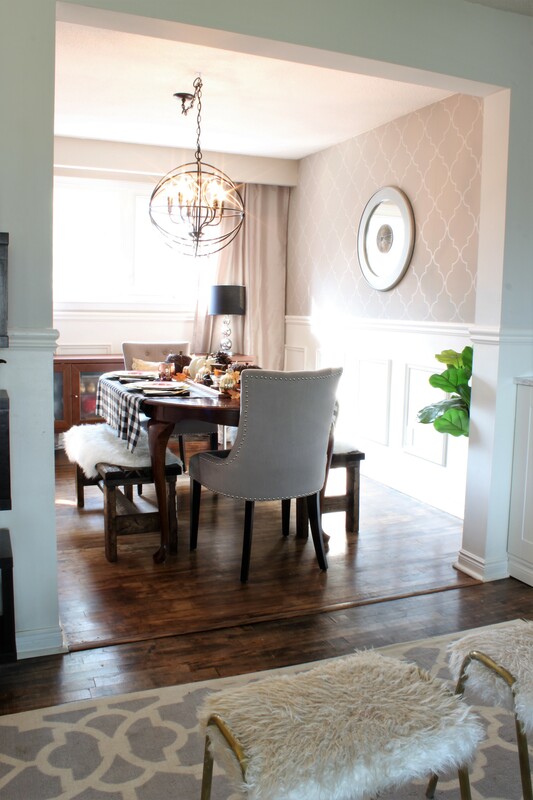 I love the wainscoting in your dining room and also the gray wall color with the pretty stencil. I’m enjoying this week’s fall tour so much!